Growing number of startups in Israel which are excelling and flourishing their business into cyber security, artificial intelligence, machine learning is supporting the wide adoption of smart mobility in Israel. Israel based technology companies such as Mobileye and smart mobility service providers such as Gett and Waze are contributing in the expansion of smart mobility business market in Israel. Further, Israel has more than 5,000 startups which are gaining huge investment by leading auto giants such as General Motors, VW, Daimler, Ford, Renault-Nissan, Samsung and Bosch to improve their services for mobility behavior projections for shared ride services or tracking for advanced driver assistant systems. For instance, in 2016, one of the leading German automaker Volkswagen invested USD 300 million in an Israeli ride-sharing platform Gett to expand its business into ride-sharing. Israeli startups are gaining huge investment and acquisition which is expected to boost the growth of smart mobility market in the country. In 2013, Harman International Industries, Inc acquired iOnRoad Technologies, Ltd. for USD 15 million to develop vehicle safety systems commonly known as Advanced Driver Assistance Systems (ADAS). In 2016, Ford Motor Company acquired SAIPS to improve the machine learning components and computer vision of driverless car systems. These acquisitions are aiming to expand smart mobility business in Israel in the near future. 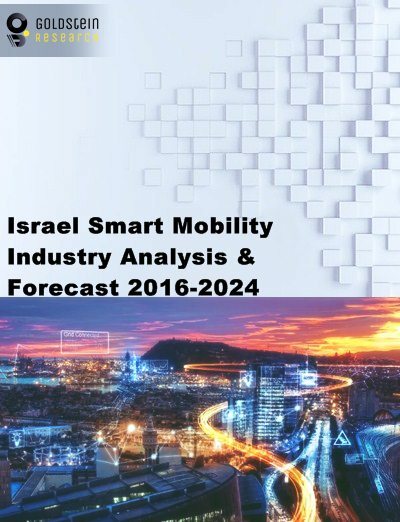 Israeli smart mobility market valued USD 1.63 billion in 2016 and is projected to reach USD 7.6 billion, growing at a compound annual growth rate of 21.2% during the forecast period. Leading companies and Israeli startups are mainly operating into shared mobility, fleet management, connected vehicles, autonomous cars and electric mobility which are expected to support the growth of Israel smart mobility market over the forecast period. Based on solutions, traffic management and infrastructure segment expected to witness higher demand across the country owing to the growing need for sustainability. Government is also taking initiatives to promote smart mobility in the country. For instance, in 2016, Israeli Government invested USD 70.9 million for the extensive research and deployment for smart mobility technologies across the country. Moreover, companies such as Innoviz Technologies and Mobileye are developing 3D imaging and mapping technology around vehicles to improve the sensing and response ability of the vehicles. Advance technological innovations disrupting the automotive and smart mobility market of Israel. With the growing trend of autonomous cars, existing OEMs and new entrants are hugely investing in the development of advanced driver assistance systems, connectivity between vehicles and systems, advance functionalities and smart traffic management which helps in enabling automated driving. Rising adoption of smart cities are inclining the consumer’s interest towards on-demand mobility, low emission cars and multimodal transport systems are likely to bolster the growth of Israel smart mobility market.